At Caroline's Pampered Pet Motel, your dog can play while you work! We know how busy life can be. You work all day and can’t ever find time to run home during lunch to check on the dog. Sometimes you wish there was a place you could bring your dog while you are away from home. A dog boarding place that’s only for the day so you enjoy your pet at night. Somewhere they can run around and be free instead of being cooped up. A dog daycare, if you would. That’s us! At Caroline’s Pampered Pet Motel, we offer a dog daycare service that is convenient for you. With our hours of 6:30 am to 9 pm, seven days a week, we will be here for you to drop your dog off before work, and we will be here when you are ready to pick them up at the end of the day. We know some dogs can be picky and only like their food. That’s why our dog daycare allows you to bring their meals that will make your pet feel right at home for the day. If don’t have time to pack everything up for dog daycare, no worries. Caroline’s Pampered Pet Motel can provide food for a small charge. 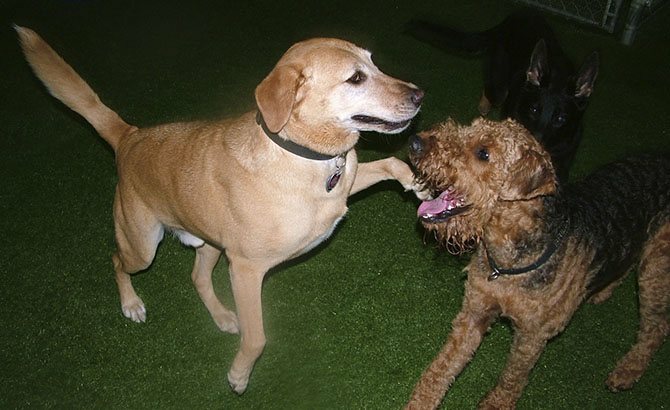 There’s Always Time for Fun at our Dog Daycare! 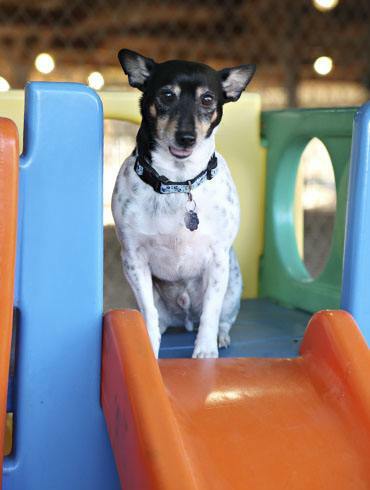 In addition to the rooms we offer, Caroline’s Pampered Pet Motel also offers indoor and outdoor play areas for your dog to enjoy during dog daycare. These areas provide endless opportunities to run, jump, chew and scratch. Your dog and its safety will always be at the top of our priority list during playtime, too. All of the fencing at Caroline’s Pampered Pet Motel is secure from top to bottom, and our highly trained staff of dog sitters will always be present in the play area. There’s nothing we enjoy more than offering all the love and attention your dog could ever need, that’s why we spend all day with them. 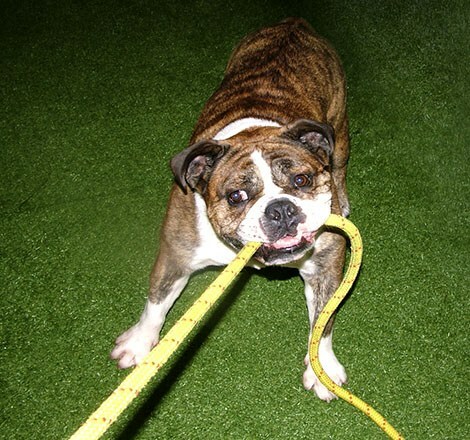 Along with an eager dog daycare staff that is always willing to play fetch, Caroline’s Pampered Pet Motel also offers Perfect Turf® Pet Grass for your dog to roll around in. We do not consider ourselves a kennel, so we will not provide cold, uncomfortable concrete floors often found at kennels. Perfect Turf® Pet Grass is soft and easy on the feet, stays cleaner than concrete, and lets our guests play on a grass-type surface instead of a hard floor. At Caroline’s Pampered Pet Motel, we’re no kennel. Just the best pet motel around; and the best dog daycare around. We will take great care of your furry loved one, no matter how they act. While you go about your day-to-day business, we will be entertaining your pet and have them bright-eyed and bushy-tailed as they wait for you to come pick them up.